We know that Celine is all about making minimalistic things, but here’s one bag that’s not following this traditional code. 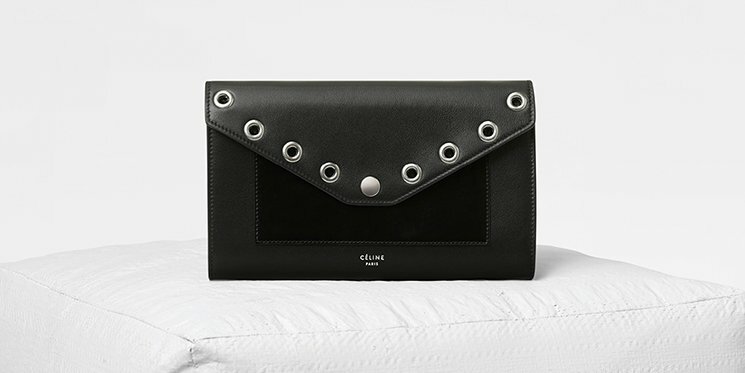 Meet the Celine Eyelets Pocket Evening Clutch On Chain for the Winter 2017 Collection. It’s basically a small-sized handbag that can be transformed into a clutch bag or vica versa. The Pocket Evening Clutch On Chain is not a new bag, it’s also available without the eyelets but it usually comes in tri-colors. This bag is also called the Pocket Large Flap On Chain. It’s a rectangle small bag with an enveloped-shaped flap. This bag is perfect to carry from Spring to Winter and it matches perfectly with any casual chic outfit in your wardrobe. 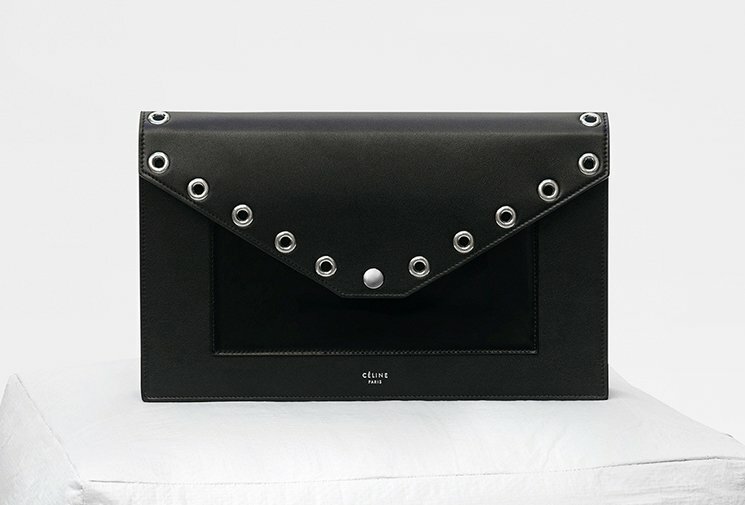 The latest edition is adorned with eyelets around the edges of the flap, which is designed to boost it’s urban-chic’nes. Now this beauty can be carried with simple tees and jeans and you will still look fabulous. Made from smooth calfskin, which a durable leather that requires low maintenance. The chains are long enough to carry cross body and it can be removed anytime to convert into a clutch bag. The logo has been embellished on the bottom front in small lettering that reads: ‘CELINE PARIS’. The Pocket Evening Clutch opens with a snap button. Inside you will find one gusset compartment and one zipped pocket. The interior fits all of your basic essentials or evening necessities. The removable shoulder chain is 20′ inches long and the bag measures 11’ x 7’ inches, priced at $1650 USD, €1100 euro, £1000 GBP, $12500 HKD, $2100 SGD, ¥12000 CNY, ¥170000 JPY via Celine boutiques.